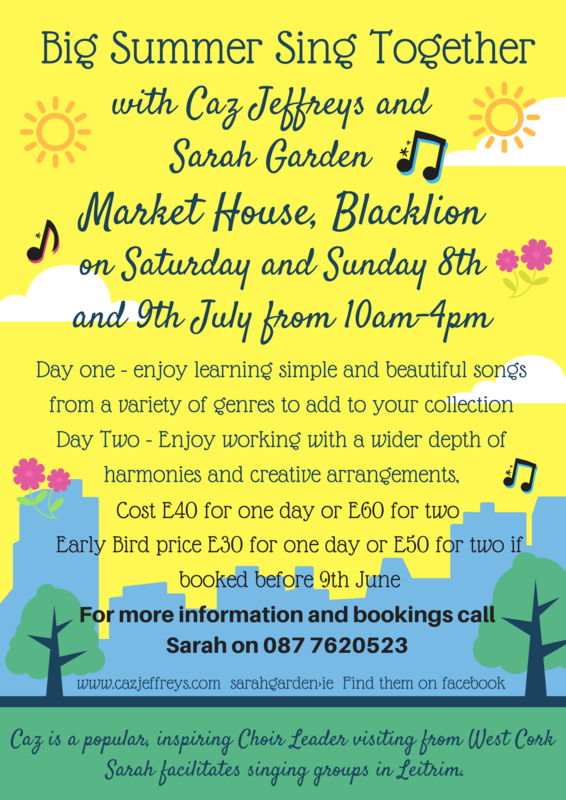 Big Summer Sing in Blacklion in July is now taking place the week AFTER I advertised, on the 8th and 9th of July. Note the EARLY BIRD offer of €30 for one day and €50 for 2 expires on the 9th June so please call me ASAP if you would like to book 0877620523. Please do look at my Facebook page and like and share the post about this event or print and put up the poster far and wide to advertise it. Thanks! Also take a look at the fabulous website for the Free Fringe Festival in Ballinamore on the 21st 22nd and 23rd July where I will be running a Fringe Sing Together in the Woods on the Sunday afternoon. There are loads of other fantastic events during this festival bands, a short film festival, living art sculptures, bush craft, stalls and loads of fantastic up and coming musicians. All for FREE! I am a community musician aiming to help you learn to listen and build a beautiful sound together with others.